Dorianne and I like to host special wine-related dinners once in a while. The idea is to get some people interested in wine together, to have some good food, to have some interesting wines, and to engage in conversation beyond the ordinary. We have found that the wine can aid and abet this kind of conversation. Not to talk endlessly about the wine itself – you know what I mean – but to tell a story in which the wine is a character and see where that leads. I will write about a couple of those dinners here. 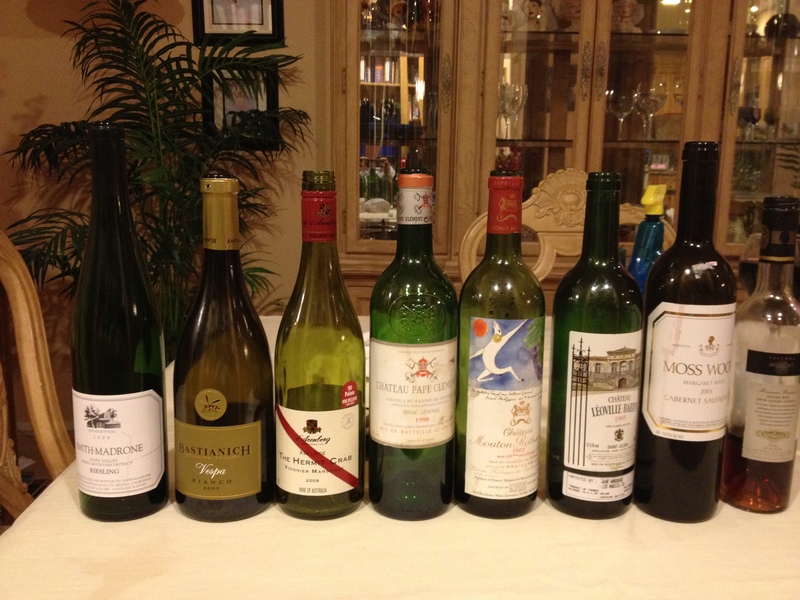 The Line Up for the Wine You’ve Been Saving for a Special Occasion Dinner. The All-Stars of the Evening. Five couples and one single attended, each bringing their special wine and a dish to go with it. Dorianne and I supplied the main course. Each couple would share how they obtained the wine, and any special story that went along with it. We ended up with nine wines. Oddly enough, only one was a California Wine. 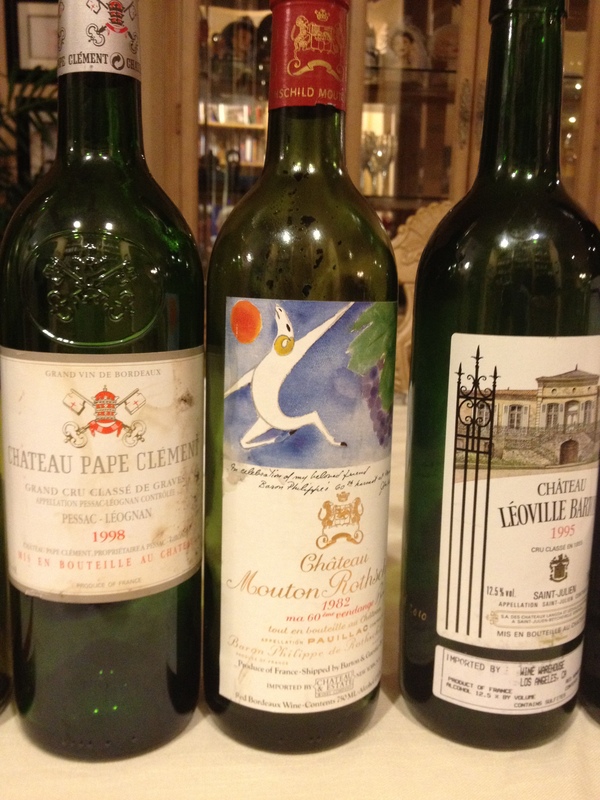 The highlight was a 1981 Chateau Mouton Rothschild, and there were fabulous wines from Australia and Italy. We provided a number of decanters for the wines – the evening was memorable on many levels. After the meal – lots of glasses! 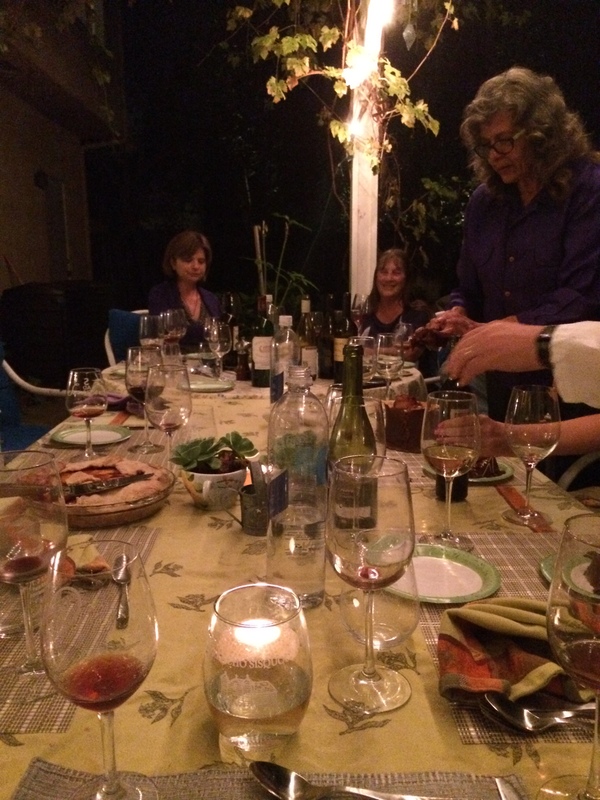 A few months ago, we hosted a “Bring a Wine with a Great Story” dinner. 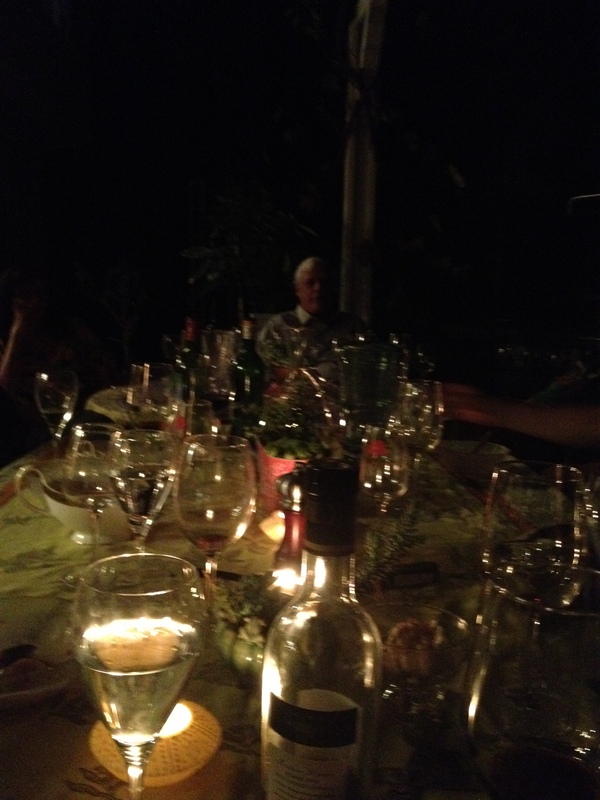 Four couples and a single friend brought food and some wonderful wines to share. The dishes ranged from pâté and melon and prosciutto appetizers to Tuscan chicken with side dishes of chickpeas and rabe and a green salad, to home-made peach pie and chocolate cake for dessert (there were two birthdays in the group). The wines ranged from the Chateaux Margeaux Premier Cru to an Il Borro Tuscan red Bordeaux Blend, to a Central Coast Pinot Noir to another Tuscan red just obtained on a trip to Italy. One friend had just flown in from British Columbia and brought two bottles of ice wine – a Merlot and a Riesling. We have also hosted dinners where you bring your favorite red or white under $25, or bring a specific varietal from a certain appellation. The idea is just to provide a theme that the meal and the experience can be built around. The joy of such occasions is to share food and wine with people who appreciate both. The stories about the wines inevitably lead to other stories – about family, travel or just about anything. We share the experience and, if the evening is a true success, the wine fades to the background and the connection come to the fore. 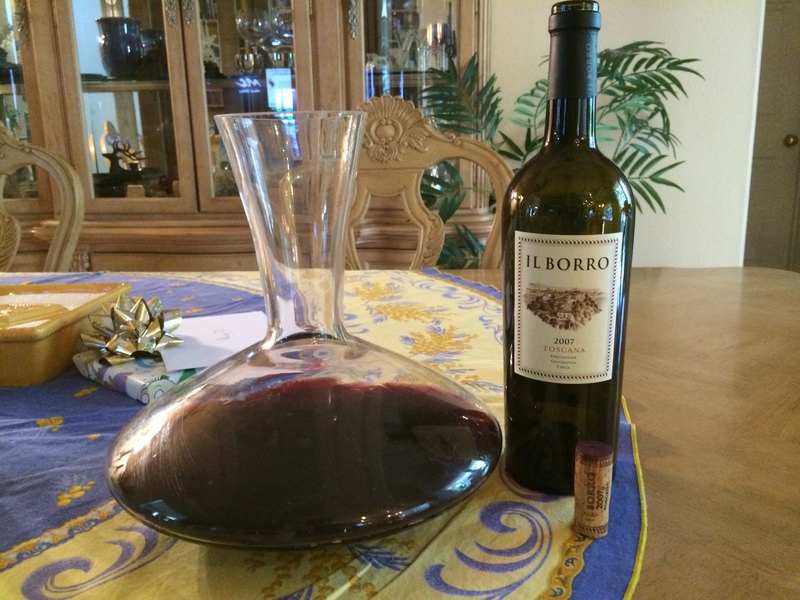 The Il Borro Tuscan Burgundy Blend in the Decanter. Dessert and Ice Wine from British Columbia’s Okanagan Valley in Kelowna. Later, the coffee is shared and the dishes are done, and people depart having experienced a memorable evening that itself becomes the next story. To plan your own special wine dinners think “Theme – Story – Invitation List – Wines – Food. Make a plan and find creative ways to invite people and to share the idea. If guests bring a dish to share, there is less work for the hosts, and more involvement in the whole experience by everyone. Have fun!